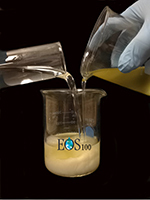 EOS100 is a 100 percent fermentable, water-mixable vegetable oil-based organic substrate that provides a lasting source of carbon for enhanced in-situ anaerobic bioremediation. EOS100 ships as a concentrate and readily mixes with water on a project site. Compared to our existing emulsified oil products, this new formulation is tailored to provide optimal oil retention in high K aquifers and soils with characteristically low oil retention such as fractured bedrock and sandy aquifers.